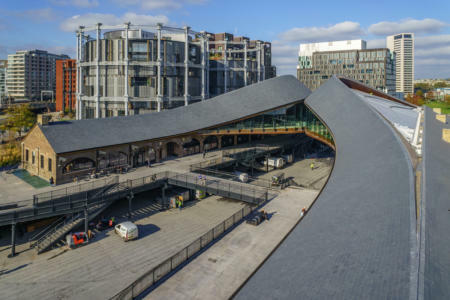 Some 92,000 Cwt Y Bugail slates feature on a ground-breaking new/old roof in London's Kings Cross. London’s Kings Cross has been transformed into a go-to destination for office workers, students and tourists. Developer Argent’s regeneration of the area has sensitively re-purposed the early Victorian railway buildings into variously, a college campus, supermarket and offices, in which the interior changes are radical but the exteriors have been left largely unaltered. The new roofs of the ornate cast-iron and brick structures have been slated with 92,000 new versions of the original Welsh Slates – 500mm x 250mm Cwt Y Bugails from the manufacturer’s Llan Ffestiniog quarry in North Wales – by Banbury-based specialist sub-contractor Attleys Roofing. Attleys already had some Kings Cross experience, using 6,400 500mm x 300mm Heather Blues from Welsh Slate’s main Penrhyn quarry for the re-roof of the nearby German Gymnasium - the first purpose-built gym in England - which is now enjoying a new lease of life as a designer restaurant. Primary support is provided by a set of large cranked beams supported on cores in each building which join in the middle over the yard. There are four primary beams, two on each building. These dip down towards the centre to create the valley between the two roof structures and have been nicknamed “giraffe beams” in reference to their angled neck and head - the structure looks like two giraffes rubbing noses together. Tie beams at floor level take the tensile loads generated by the weight of the roof. Visually, it was important to maintain a seamless transition from the existing roof to the new section so the original timber roof trusses were retained where possible, with some localised strengthening required where the timber had been damaged. The gap between the existing and new roof structure was then boarded over ready for the new Welsh slates. The two roofs are bolted together where they meet in the middle. 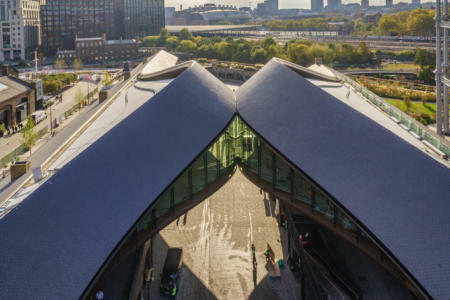 Heatherwick Studio chose to position the new roof element at the northern ends of the two buildings as the eastern building had been devastated by a fire in 1985. Used more recently for warehousing and nightclubs, they were largely abandoned in the 1990s. Group leader Lisa Finlay said: “Our challenge was to radically remodel this Victorian infrastructure to meet the needs of a modern urban development without losing what made them special. Attleys were on site for a total of almost 18 months. 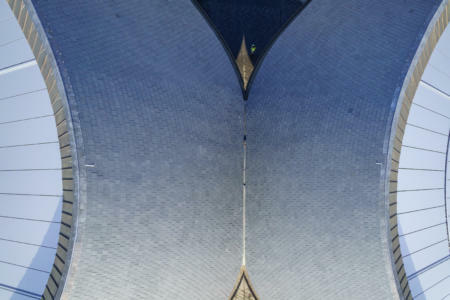 The roof pitch of the original sections of roof was 28° but as the curves swept around and met in the middle this changed to 47°. Thereafter the length also decreased from 8.4m to 6.9m at the kissing point where the two curved roofs met but the same number of courses of slates (44) had to be maintained. 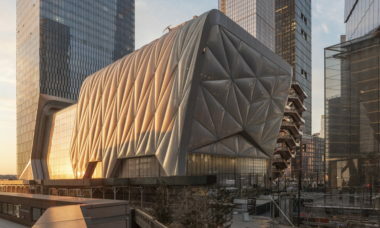 Attleys’ managing director Shaun Attley met with Heatherwick Studio and BAM’s design team up to two years prior to commencement on site to discuss the design issues and how to achieve the aesthetics requested while using the products selected. Shaun advised the project team that the Cwt Y Bugail slates could not be used for their initial roof design which exceeded a 90° pitch so it was re-designed to ensure that where the eaves met it was at a pitch commensurate with Welsh Slate’s fixing recommendations and warranties. Due to space being at a premium, all the Cwt Y Bugail slates were cut off-site at Attleys’ depot in Banbury. To do this, Attleys had to calculate how much of the slates needed cutting off. This was done by taking measurements from the steel work underneath - from steel to steel at the eaves and steel to steel at the ridge which was generally over 10-15m depending where you were on the curve (on the internal curve or external curve). The kissing point determined how the slates were cut to ensure the perp lines and side laps were maintained. Shaun Attley said: “Our timescale for the sections of roof was provided to BAM Construction and this was put into their overall programme with all other sub-contractors but unfortunately our commencement on site was delayed due to previous issues in the construction of the steel frame prior to us starting. He added: “The project was challenging at the beginning to ensure we set the roof out properly but as the contract progressed it became easier. Welsh slates are easy to work, and we work with them all the time, but in this case it was challenging getting the slates to course all the way round." Attleys’ SMSTS-trained supervisor ran the day-to-day safety, conducting Toolbox talks every morning and attending daily safety briefings by BAM Construction staff and supervisors from all trades on site to brief each other of any risks and ensure trades were not disrupting one another. “We found some of these measures not only improved safety but also helped improve production,” said Shaun. Attleys also had an independent safety inspector (from The Health & Safety People) visit the site monthly to see if there were any safety improvements they could recommend.